Say “Hello” to your NEW Hazardous Waste Manager! MLi Environmental » Blog » Say “Hello” to your NEW Hazardous Waste Manager! • Environmental Protection Agency (EPA) walks in, who do they talk to? • What your chemical waste is stored in? • Whose fault is it if your transporter misplaces your drummed waste? • Where your waste from last year is disposed? • How do your technicians get trained for safety and hazard awareness orientation? • What a typical fine is for allowing an unqualified and irresponsible person to sign a Uniform Hazardous Waste Manifest? These questions are not normally understood, nor can they be properly answered by the office receptionist. In a small company, the EPA officials are normally directed toward the business owner or General Manager. The GM usually has their hands full of the more mundane tasks of managing people and marketing. How the small business GM approved a disposal shipment 6 months ago and can’t remember who the shipper was is not unusual. A larger organization creates the revenue that can subsidize a full time Hazardous Waste Manager. That manager is usually a highly educated person with multiple college degrees and he is continually training. This allows his company to minimize it’s insurance liability when it comes to labor safety practices and facility insurance coverage. There is an annual budget set aside for his/her salary. Most small companies do not have a full time, staff Haz Manager. 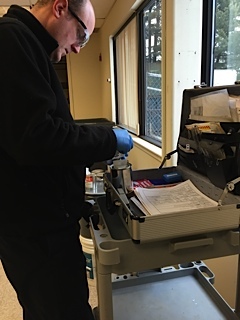 While they may have some knowledge of what is on-site, unfortunately no employee wants to be responsible for signing away the chemical waste on a Hazardous Waste Manifest. Why would they? They are not getting financially compensated and trained for the tasks. MLi Environmental LLC, understands this and is prepared to assist as YOUR “on call” Hazardous Waste Manager expert consultant. We bring over 20 years of experience to the table and can resolve multiple problems that you simply do not have the background to resolve quickly. Think about it. Call or email us with your needs and we can engineer a solution to help. We have personal experience in Labpack (lab chemical removal), chemical identification, unknown testing, poison gas and toxic disposal, radioactive removals, profiling, chemical storage, recycle, paperwork, waste transport, reports, hygiene, etc. It just makes sense, Hire us.